I may have misled some of you, but I’m staying in Central Poland for this week’s walk. 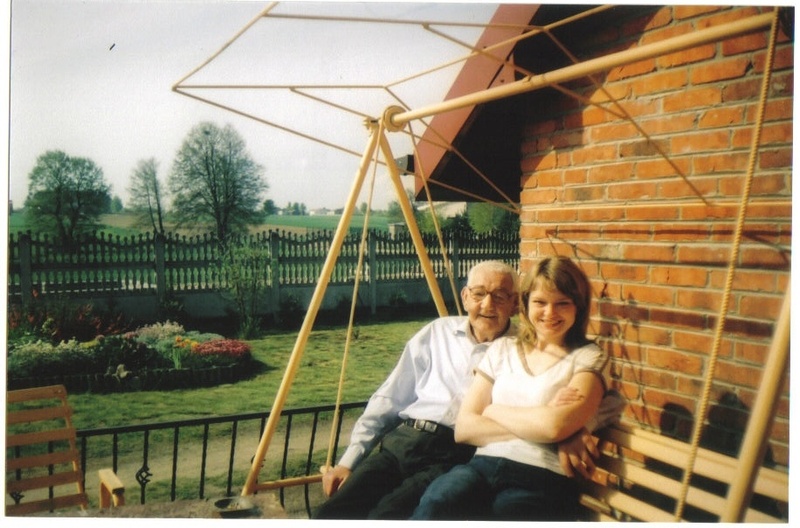 I expanded on a little of the family saga last week in Zawady, the village where Dad was born. 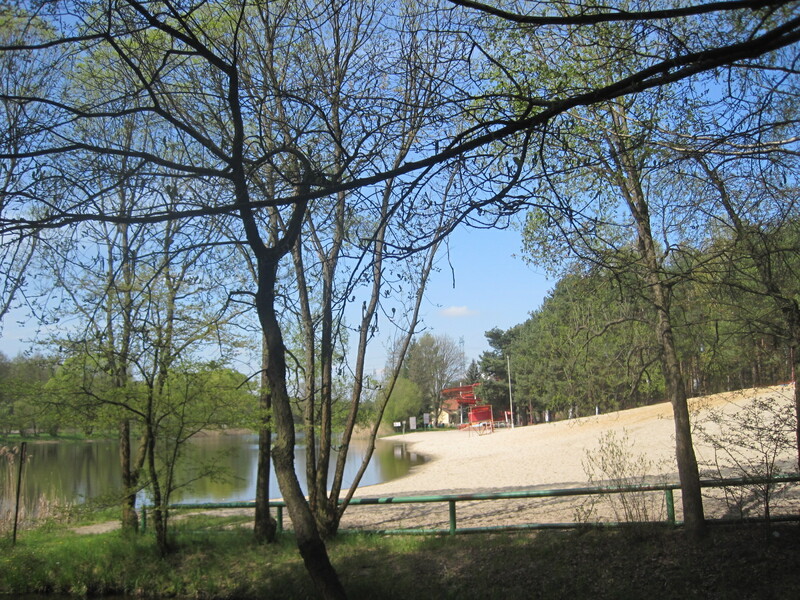 Today we’re taking a stroll around Bełchatów, the county town, some 7kms and a bus ride away. 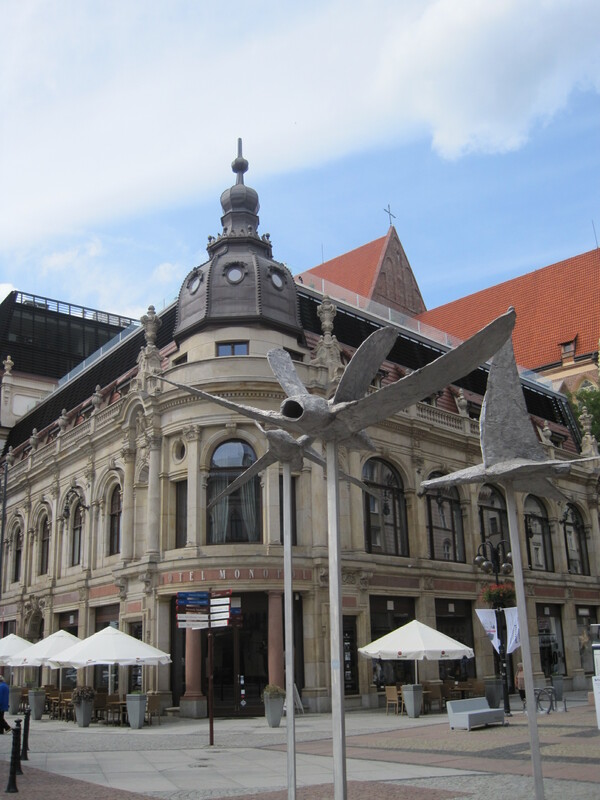 B is for Bełchatów covers much of the town’s history, so we can simply concentrate on how the place looks today. (Bew-ha-toof is very roughly how it’s pronounced) The Tourist Information office is small but friendly, and perfectly placed for our start, on Ul. T. Kościuszki. Ignoring the map in my hand, I’m drawn to a passage beside the TI, with a glimpse of green space beyond. I follow it and find myself in rather a nice park. I cross the bridge over the lake and notice a canal leading off through the park. 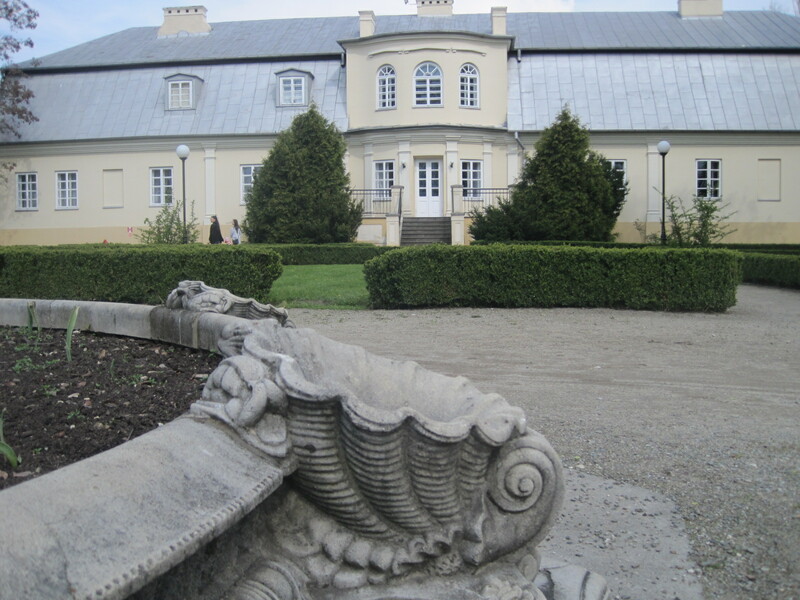 The imposing building in my opening shot proves to be Muzeum Regionalne, a late Baroque listed manor. I wonder about its contents, but my curiosity about the water is greater. I follow it, out beyond the park. On the map it’s shown as Rakówka, and Olszewski Park. I wander a little way to see where it leads but, when it seems I’m getting too far from the centre, I double back through the houses. A street corner church thankfully looks familiar, and I’m back at the junction of 9 Maja and Kościuszki. I look at the signs on shops for clues as to what I might buy there, hoping to purchase a few small gifts for the family. My niece Ania and husband Hubert are shopping at the new shopping gallery and Tesco’s, but this has little appeal for me. I prefer the more traditional shops, but they can be a little mystifying. I’ve come full circle now and am back at the museum. Opposite the TI stands Kościół Narodzenia, the church where Ania and Hubert were married. I remember it as being very beautiful inside. 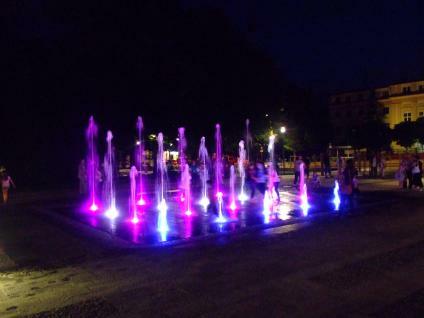 Beside the church, a new addition, Park Narutowicza, provides entertainment with it’s ever changing fountains. 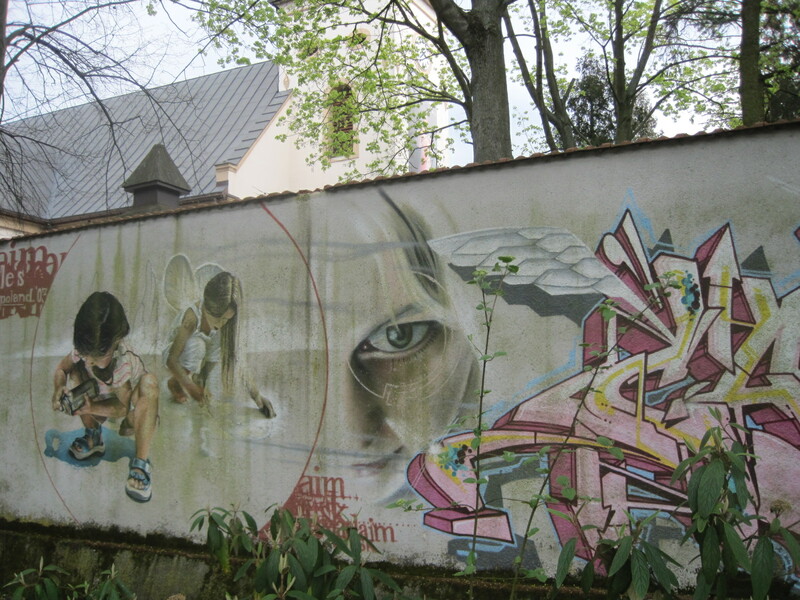 And a little street art, too. From being a beautiful balmy day, the sky has begun to darken, exactly as the forecast had indicated. I look for shelter, just in case, and am drawn to a sign, ‘Giganty Mocy’. Not at all sure what I’ll find, in I go. The gallery space is a revelation. The rain is spotting when I come out again. A nearby florist provides the first of my presents, and I pause to read the synagogue sign. I backtrack a little way to a small indoor shopping centre, where chocolates and brandy are easily purchased. The sky gets blacker and the rain starts to bounce. People scurry for cover. Nothing for it but to seek shelter until Ania and Hubert have finished their shopping expedition. ‘Degustacja’ meets my requirements perfectly. There’s cake, of course! 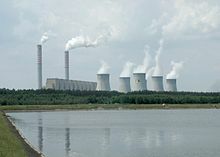 Bełchatów has become a big town, with numerous housing estates, largely due to the proximity of the power station. My walk today centres on the older part of town, and nearby there’s also a huge outdoor market. I think it’s fairly typical of many Polish towns. 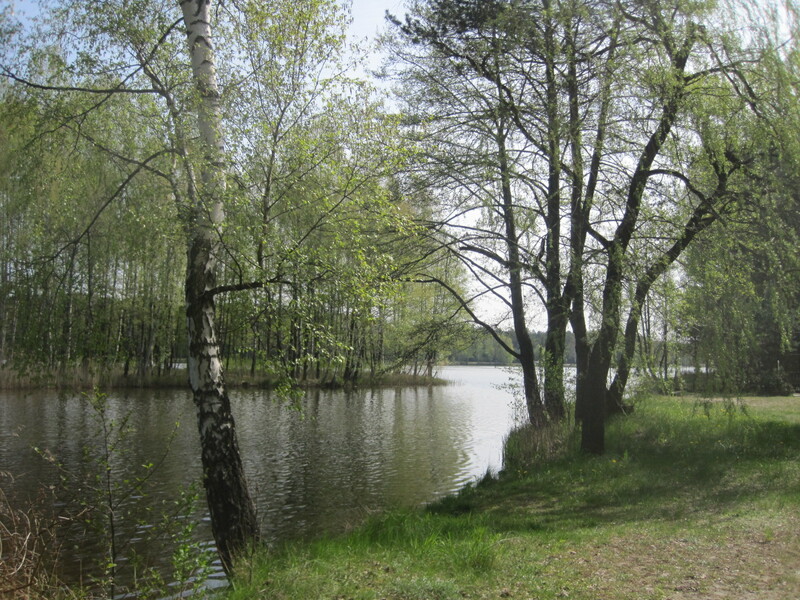 This website will give you a few facts about the area, including my recently featured Zbiornik Wawrzkowniza. 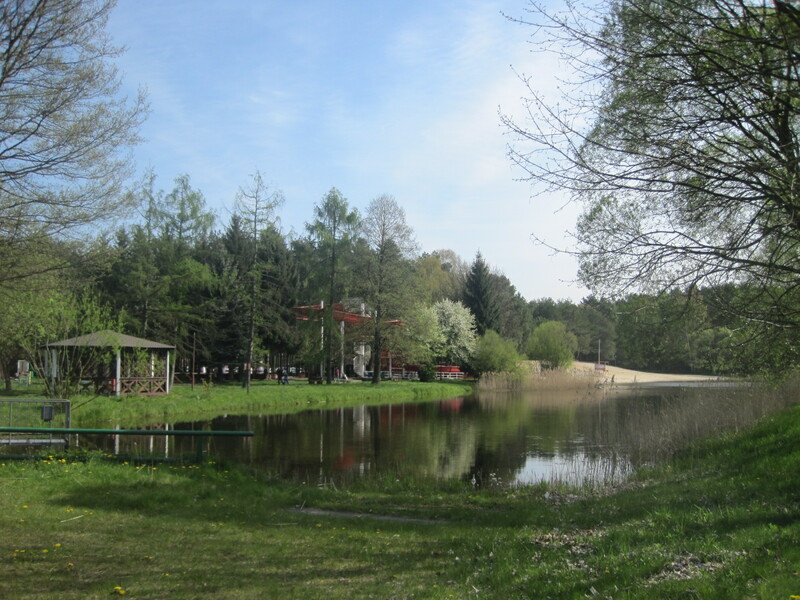 I have one more small town to show you before heading south to Kraków. I hope you’ve enjoyed the series and can come along with me. Meantime, coffee, I think. Don’t you? Many thanks to all my contributors this week, and to my readers too. As always, there are some great walks featured below. If you’d like to join me, details are on my Jo’s Monday walk page. Just click on the logo. I am in awe of this lady! Tish, doing ‘qi gong’, surrounded by dappled lushness. Wouldn’t you want to be there? Do be careful Drake’s green-eyed monster doesn’t get you! Pauline gives us lots of reasons to visit Brisbane, and even goes interactive! That’s it for another week. The weather here has turned dreary, but that’s Bank Holidays for you. I have much catching up to do. See you soon, and happy walking! Life is pretty busy for my Polish family, so when I was bundled into the car for a swift outing, between shifts of work, I didn’t know quite what to expect. Staying in rural Zawady, I seldom did. Language so often seemed to get the better of me. With interest I gazed out of the window as we passed through our local town, Bełchatów, and soon after that turned down a path signed Zbiornik Wawrzkowizna. I know! Not the easiest place name you ever saw. Dad insists that Polish is simple. You just spell out each letter, slowly. Mystified, I followed, as we left the car in woodland parking. A complex of buildings sat off to one side, and a gate led to a small animal farm and stables. My cousin, Jadwiga, smilingly explained that she sometimes comes here to ride, and pointed out her favourite horse. It was dimly lit in the stables, so I can’t show him to you. Soon though we were out in bright sunlight, beside a swiftly flowing canal and heading towards a vast expanse of water. 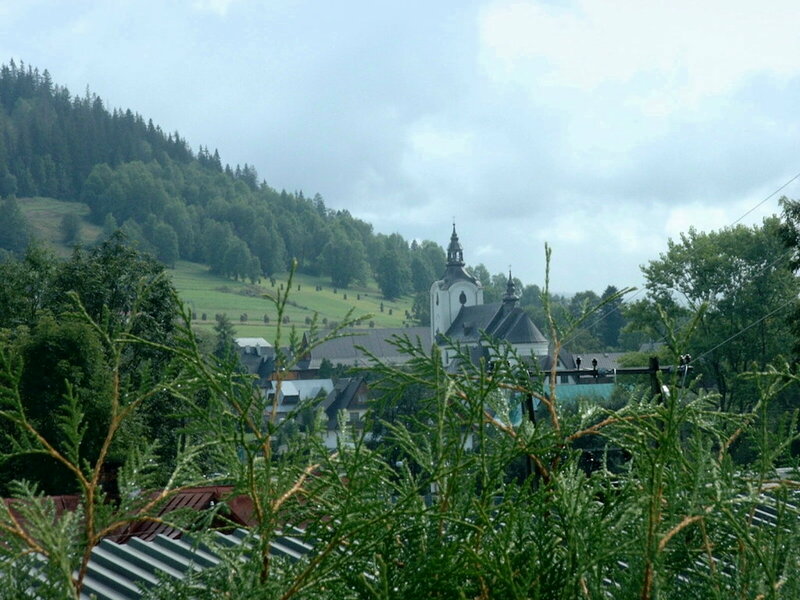 Nestled in amongst the trees were a series of tall, green Toblerone-shaped chalets, several of them occupied. A few youngsters lounged on the steps, idling the day away. It felt a little like ‘Center Parcs’ and I realised that it was, in fact, a sports and recreation centre. In Summer there would be an admission charge, but in low season it was free to wander, and we did. 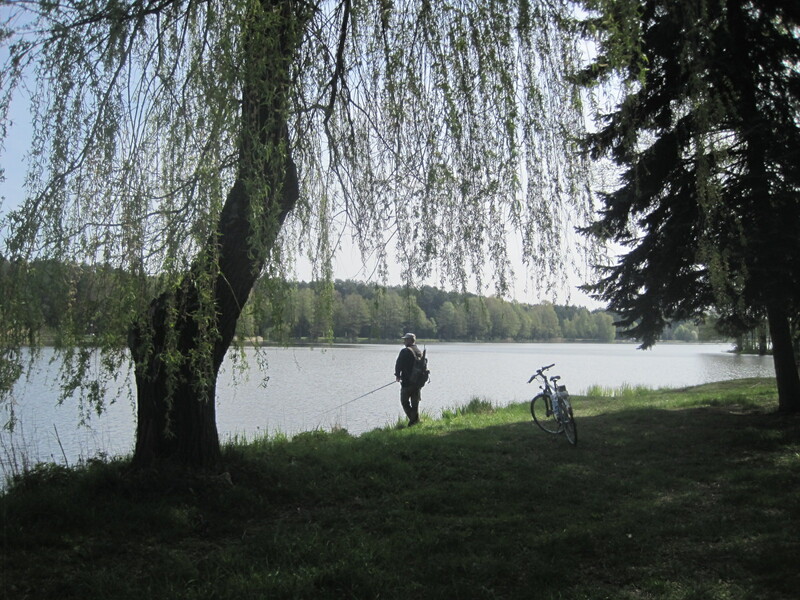 It was wonderfully peaceful, with just the odd angler, casting a line. 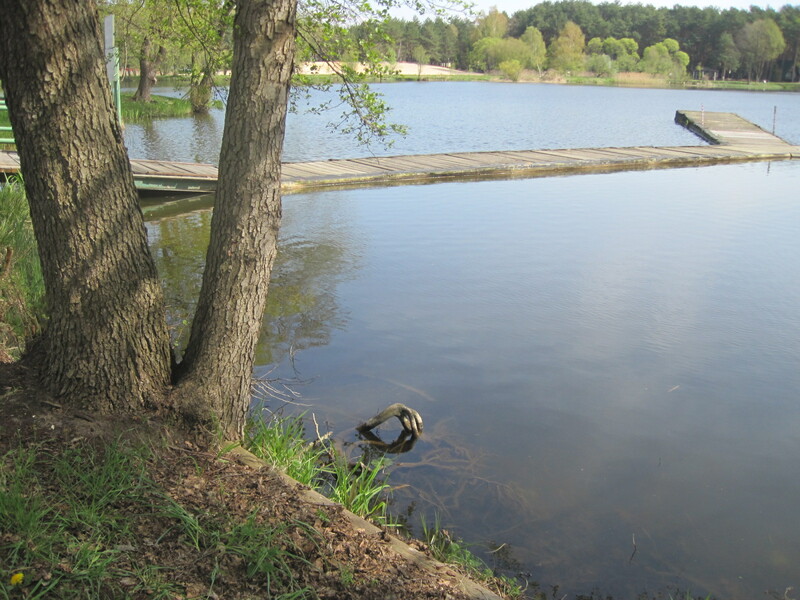 Fishing competitions are held here sometimes, and in high season there are kayaks and pedaloes for hire. A small child, well-wrapped up despite the warm temperatures, was digging in the sand on the man made beach. Her Dad hovered indulgently nearby. Looking out across the lake at a certain point it becomes impossible not to see what everyone takes for granted around here. Smoke rising from the chimneys of the power station that brought employment to this area. A blot on the landscape. It’s rather sad, isn’t it? But no-one seems to mind. Jadzia had happy memories of distant summers, spent splashing around in those waters. And we had no time to linger. 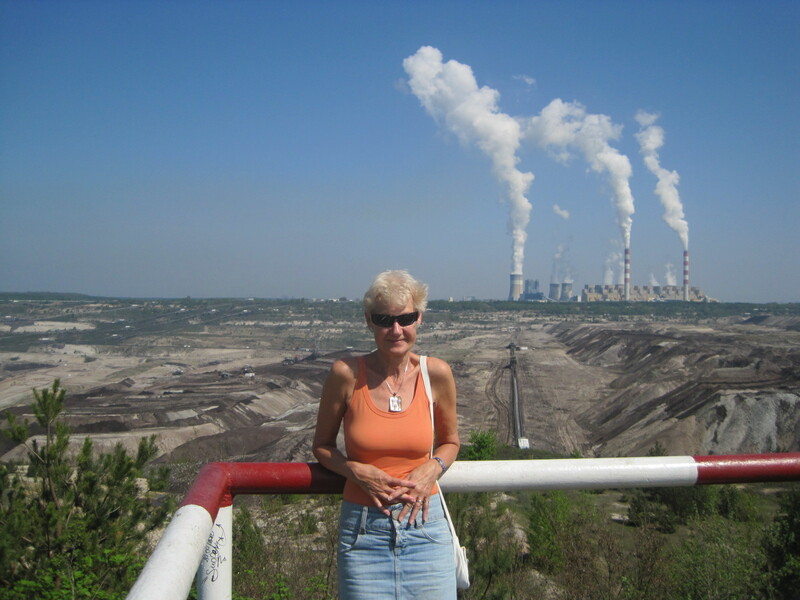 Her husband was off to work- at the power station, of course. I’m having great fun trying to keep pace with both of my A-Z challenges, at Frizz’s weekly pace! On Tuesdays the new letter comes out, so yet again I find myself leaping from Portugal to Poland. It’s quite a stretch! 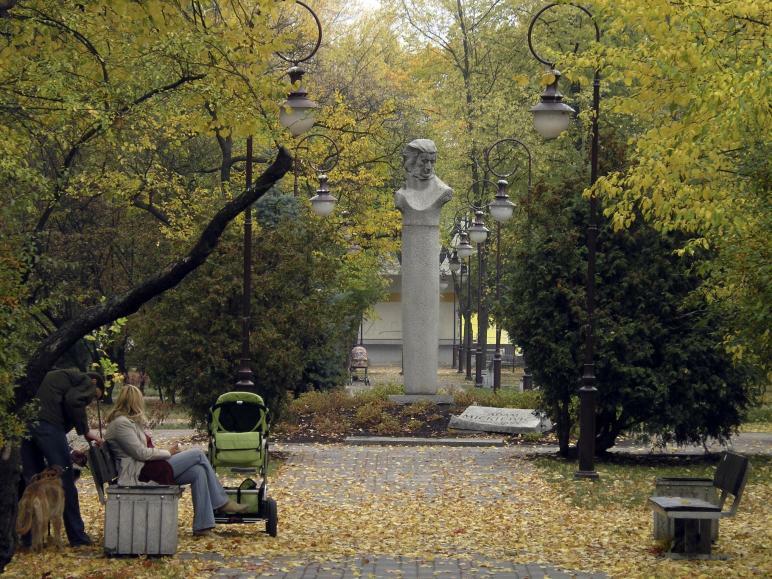 Can you guess what “nie rozumiem” means? “I don’t understand”. It’s probably the expression I have used the most in my visits to Poland. Despite the best of intentions I struggle to get my ear attuned to Polish, and you can’t really say “please will you write it down so I can understand”. It doesn’t seem polite somehow, and rather impedes the flow of conversation! 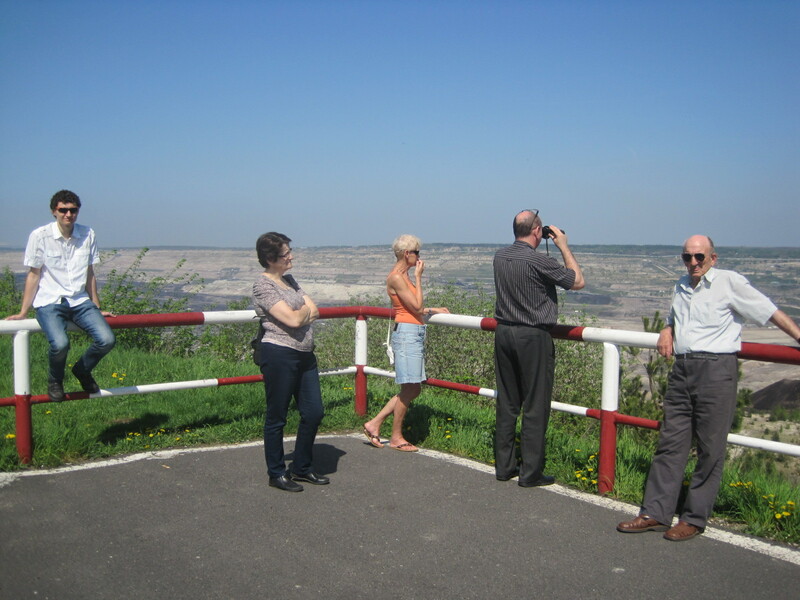 Another thing I’m not great at understanding is feats of engineering, but even I could see the type of industry that was going on when the family took me to inspect the nearby mine at Bełchatów. 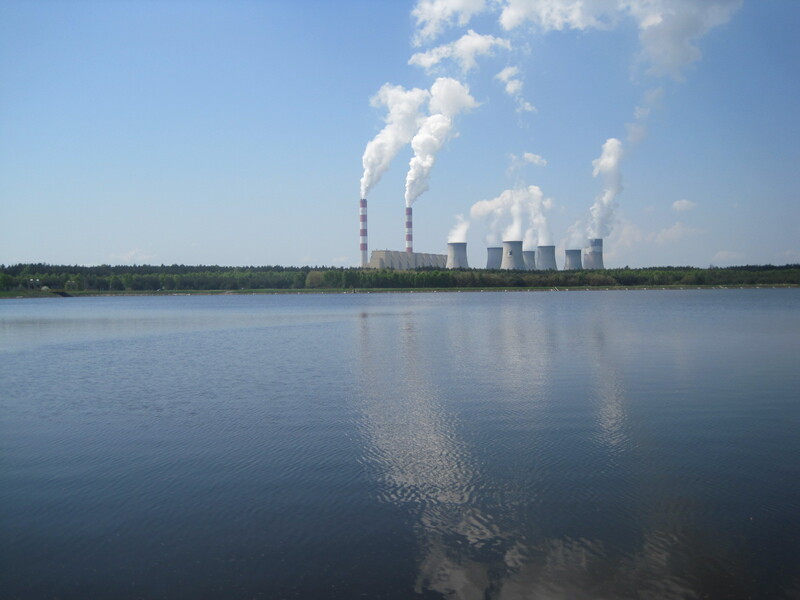 This is Europe’s largest coal-fuelled thermal power station. There are huge viewing platforms from which you can observe most of the process. It’s the chief employer in the area and many of my family have worked there. The technology looks impressive. Imagine having a lovely home like this right next door! 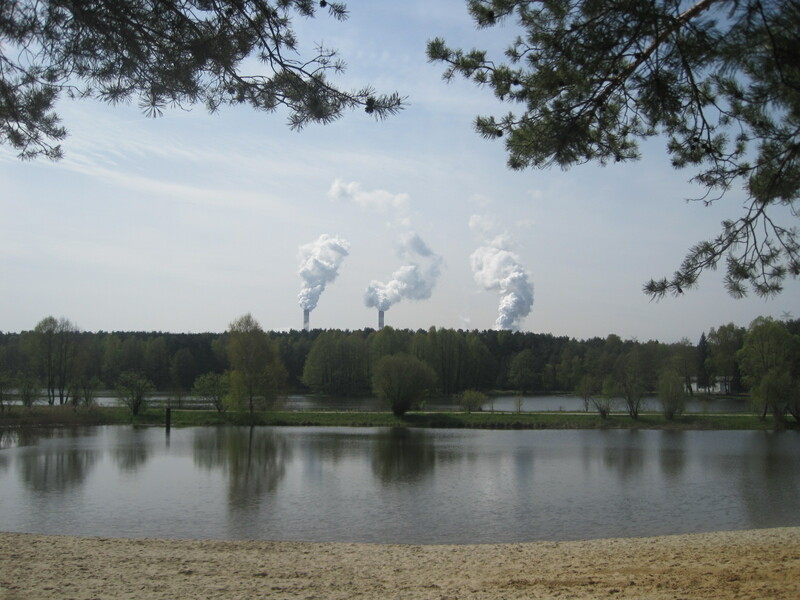 We drove all around the enormous site to a lakeside location with sports facilities, and, you’ve guessed it, a cracking view of the power station! Apparently it’s very popular in Summer. 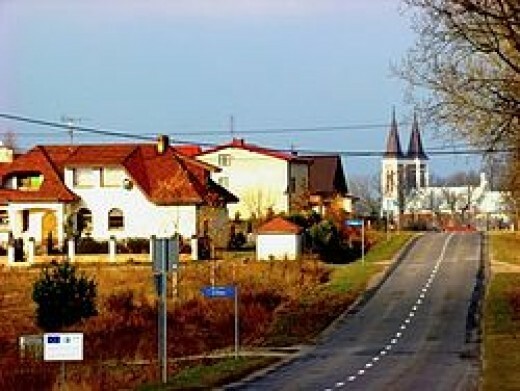 Bełchatów is far from the seaside. But the family were happy and smiling! 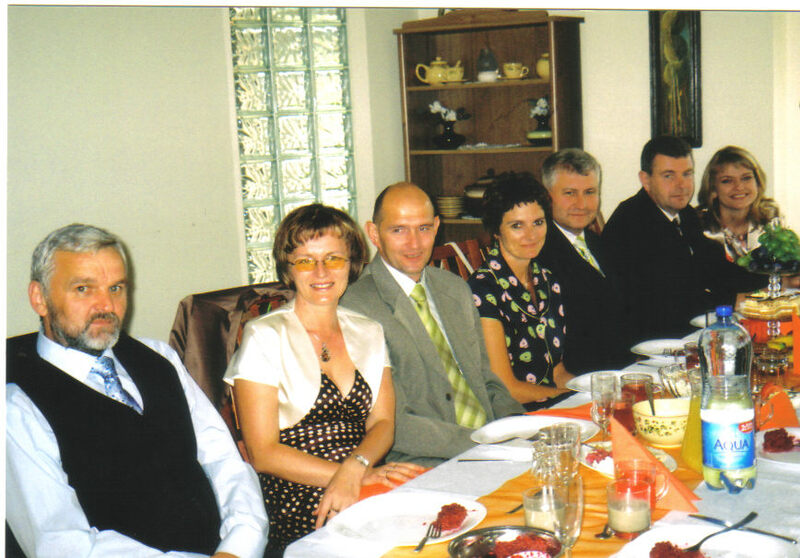 Left to right they are- Uncle Jakub, cousins Adam and Bożena, Kuba in the background (Bożena’s younger son), cousin Marta, who is also married to Adam, and Czesława, Jakub’s wife. I hope you are paying close attention. There may be a test! It was a warm day and afterwards Adam took us all for icecream. There was one more treat in store. Back at Jakub’s, Czescia cooked “ziemniaki z smażony tłuszcz”- potatoes with fried pork scratchings. It was explained that the dish was very popular in the days when people had nothing in Poland. Potatoes were an important staple and I have tasted some of the best potatoes ever, homegrown from Aunt Lusia’s garden. I have to say that today’s dish was not much to my taste, but Dad and the family made short work of it. I hope you’ve enjoyed my little venture into Polish culture today. I have to thank Julie Dawn Fox for starting the Personal A-Z Challenge, a long time ago, and Frizz at Flickr Comments for helping me to catch up. The links and logos give more information. I can breathe a sigh of relief now because I have already posted the letter “O” for both Poland and Portugal. You can read them from my A-Z pages. You may remember, when I started my personal A-Z challenge on Poland, I gave you the briefest of introductions to the Polish Alphabet? Well, “h” is one of those letters that is very little used, at the beginning of a word, in Polish. More often you will see “ch”, which is pronounced as in the Scottish word “loch”. Thus “chleb” (bread- very delicious in Poland!) sounds a little like “Hleb”. Are you following me so far? When it came to choosing a word to represent “H” in my A-Z, I had few choices. My first thought was “Historia”, but it would take a far better woman than me to tackle Polish history in a single blog post! So, I had “Hiszpania” or “Holandia”- not very appropriate in a blog about Poland? Or “huśtawka”- a lovely word that means “swing”; “hokej”- a game I was rubbish at in my schooldays, or “humor”- couldn’t we all use a little of that! It was when I thought back to my first ever Polish lesson that the solution became clear. I pounced with delight on the word “hotel”, leaping out of the text to embrace me. Pronounced, of course, in the Polish way, but a familiar and welcome sight, never-the-less. It is one of a dozen or so words that have been adopted into the Polish language. To date, I have stayed in three Polish hotels. 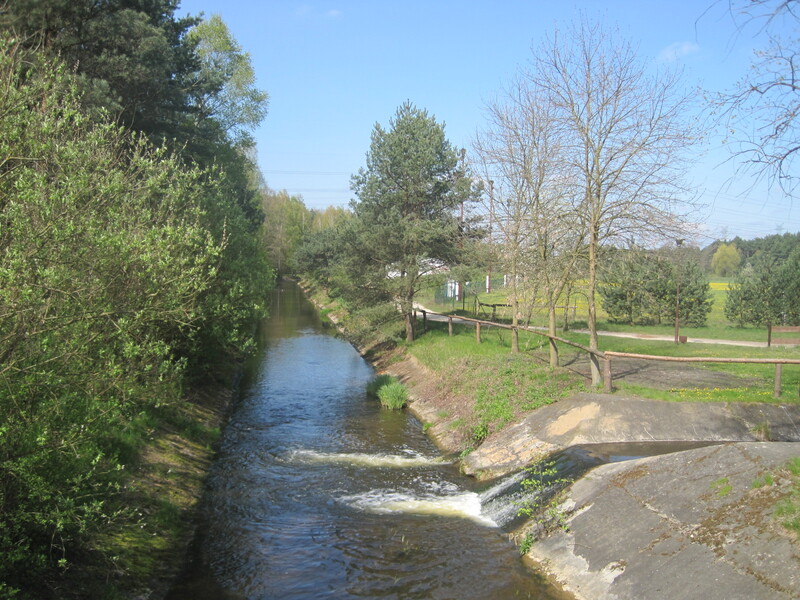 I mentioned one of them in my post B is for Belchatow. Because I am visiting family when I go to Poland, and am made very welcome in all of their homes, I seldom have need of an hotel. When my husband, Michael, accompanied me, on the occasion of Krzysztof and Marzena’s wedding, we needed a little privacy, and opted to stay for a few nights in the Sport Hotel. 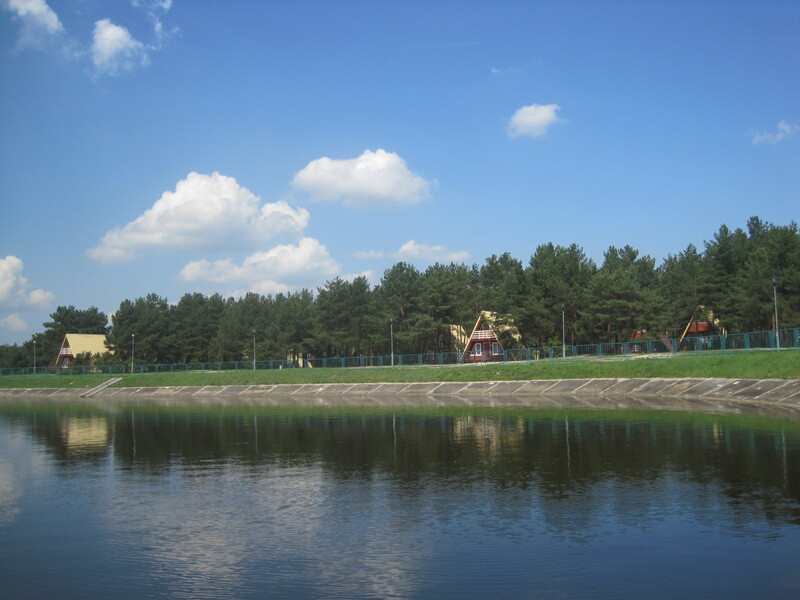 Large and central to Bełchatów, it made a great base for exploring the town. But then, as now, my Polish was a little shaky, and on a sweltering hot day we were served piping hot soup with our breakfast. Michael’s faith in my ability to negotiate the Polish language was severely dented. 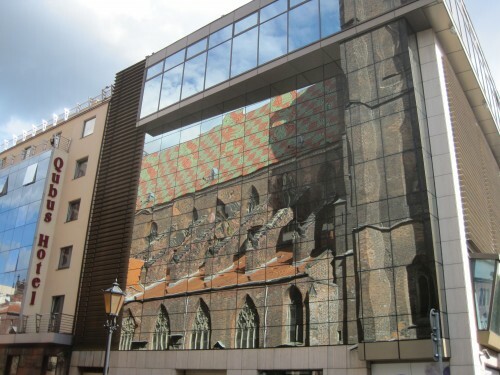 Visiting family in Wrocław with my Dad, I again stayed in a local hotel, though Dad managed to squeeze in with the family. Living in a 3-bedroomed flat, with 3 children, dog, cat and terrapin, private space is a luxury for my cousin, Wojtek and his lovely wife, Agnieszka. Despite this, I have seldom met a happier, more close-knit family. 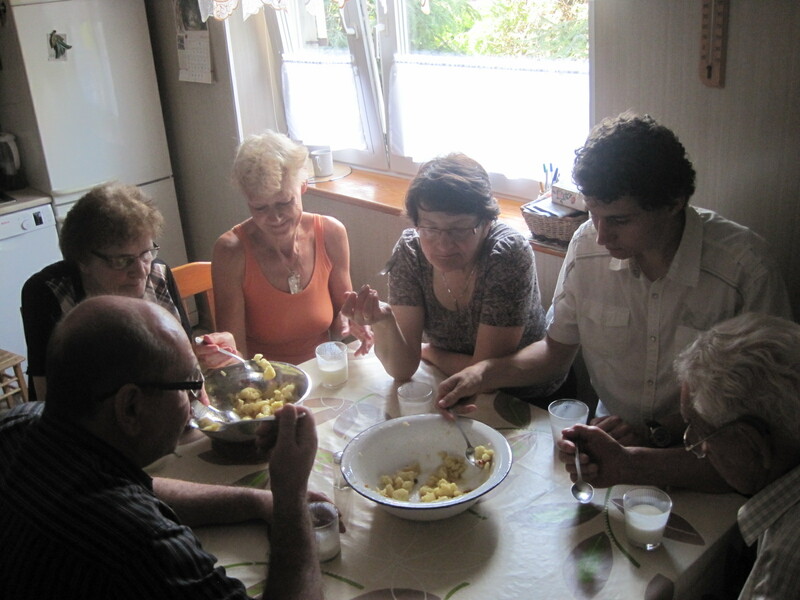 I could not have been made more welcome in sharing meals and family time with them. Both work, but were at great pains to show me their beautiful city, and once I’d got my bearings, set me loose to wander, returning when I was hungry. I’m not known for my sense of direction, so this sometimes took longer than planned. 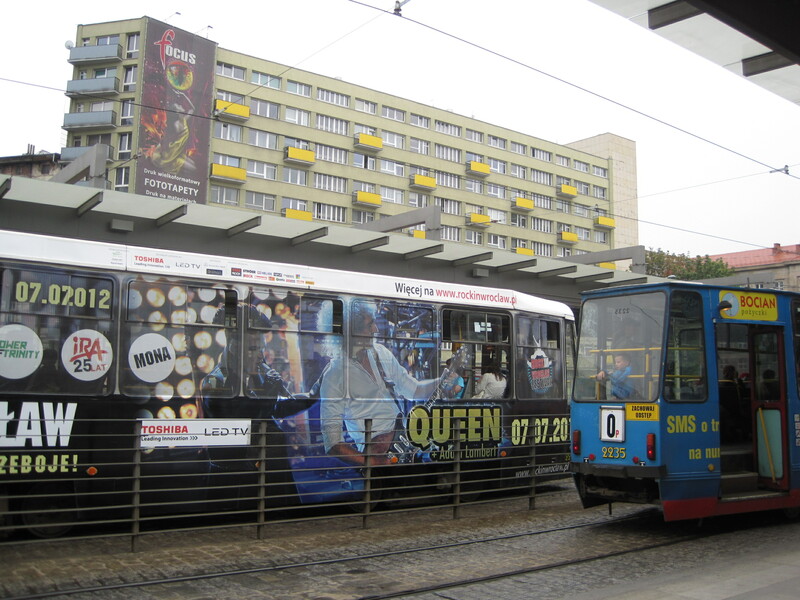 I haphazardly changed trams and buses half a dozen times, and walked and walked till I found them again! But a smile, a hug and a plate of food always awaited, before I returned to the hotel for the evening. I never ate breakfast at the hotel- goodness knows what I might have ordered! 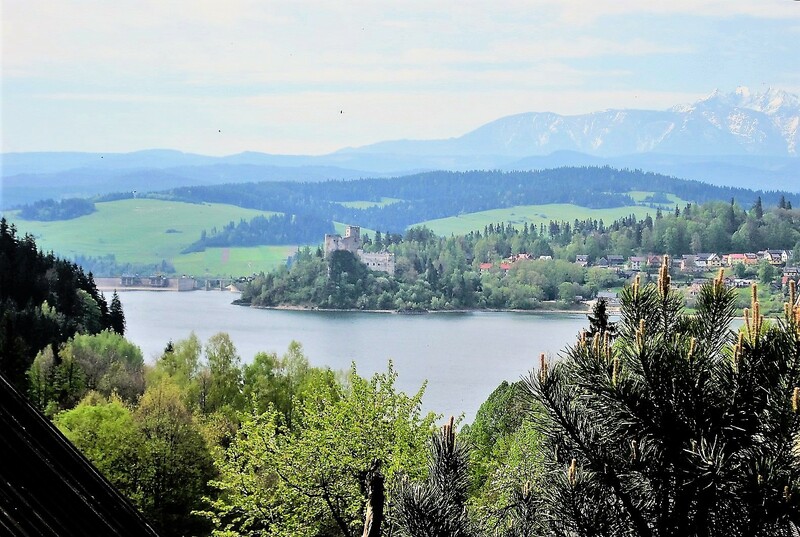 My third hotel experience occurred in the small village of Poronin, in the Tatry Mountains area, and was the most joyous of occasions. Not unlike a large Swiss chalet, the Hotel Weronika (don’t forget to pronounce the “w” as “v”) provided food and shelter for a huge gathering of us on the occasion of Adam and Marta’s Silver Wedding. The setting was beautiful, and the hotel grounds provided lots of space for the youngsters to use up energy. (theirs, and ours!) And then, in good old Polish fashion, we ate, danced and drank till we could do it no more. 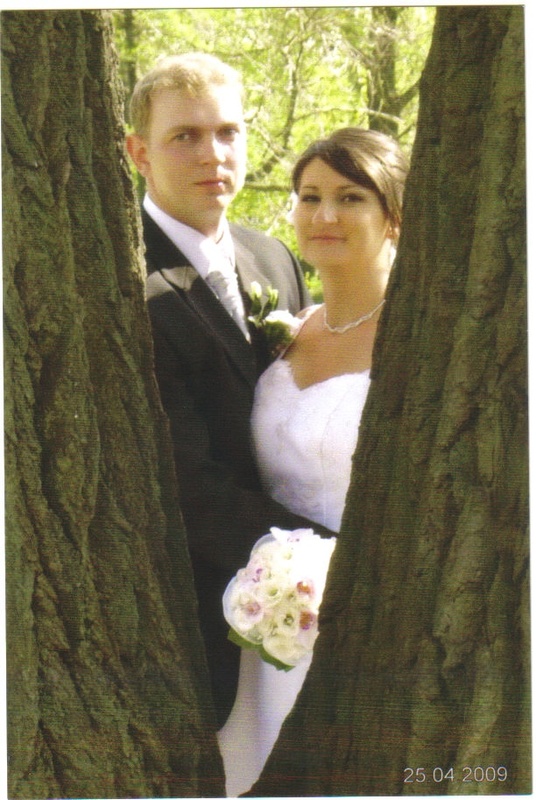 Adam’s oldest daughter, funnily enough called Weronika, is getting married in May 2014. What a celebration that will be! 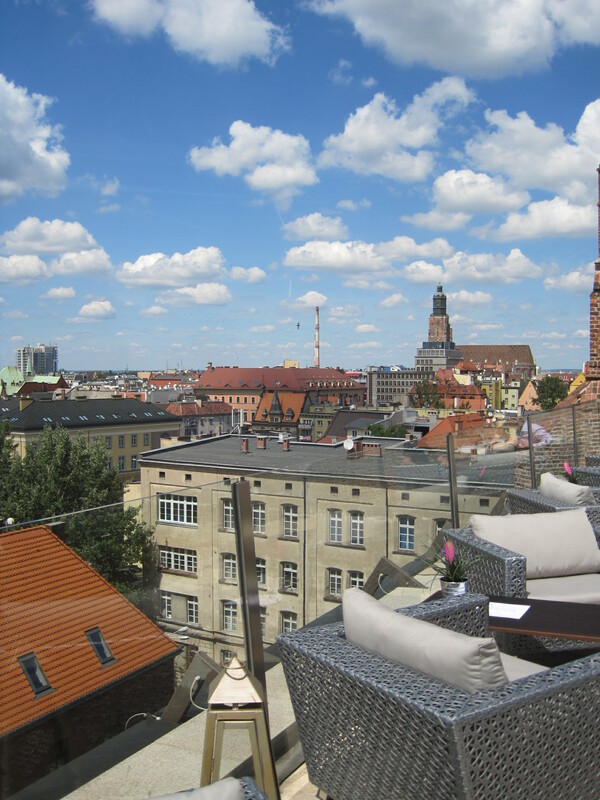 I think that’s enough to tell you about my hotel experiences in Poland, for now. You can find more of the ups and downs of my reunification with my Polish family on my personal A-Z of Poland page. Meantime, if you’d like to join in with Julie Dawn Fox’s A-Z challenge, the banner below will take you to the main site, where you can have a good look around. Bełchatów is an ordinary town, on the flat plains of Central Poland- 50km south of Łódź and 160km from Warsaw. It has a football team, GKS Bełchatów, and a volleyball team (the national passion), Skra Bełchatów. There is no local rail link, so buses are the main form of transport. 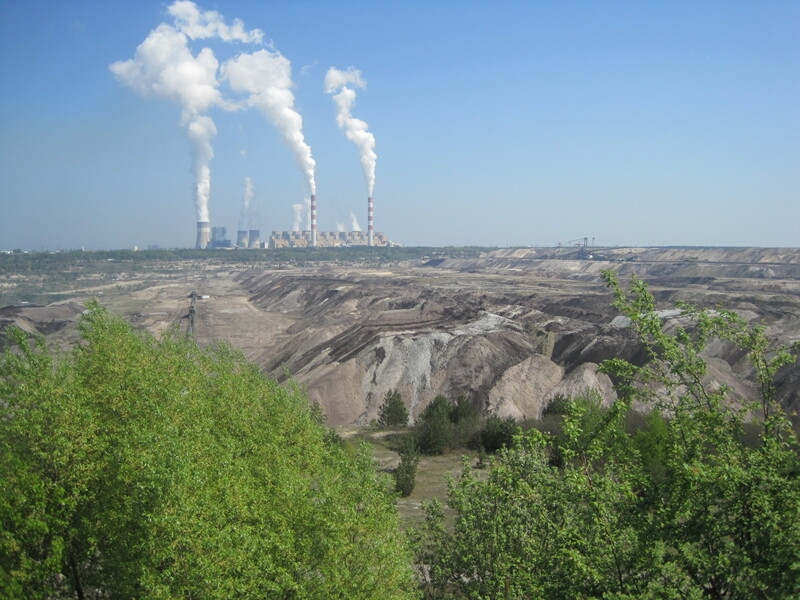 If you look in Wikipedia you cannot fail to see that it has the largest coal-fuelled thermal power station in Europe- a blot on the landscape but a huge source of employment locally. 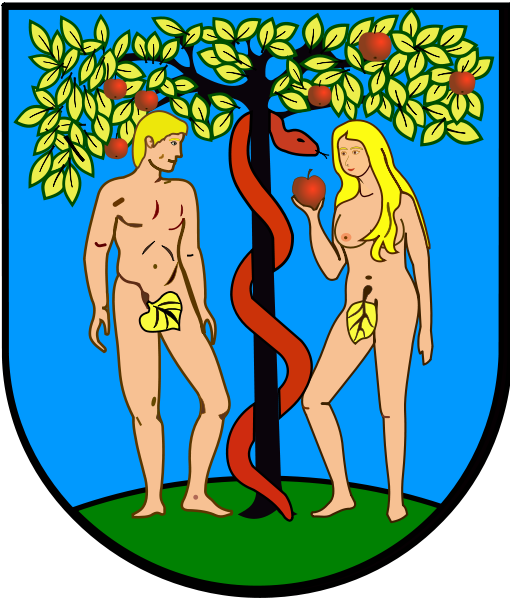 Quite randomly, it is twinned with Alcobaca in Portugal. 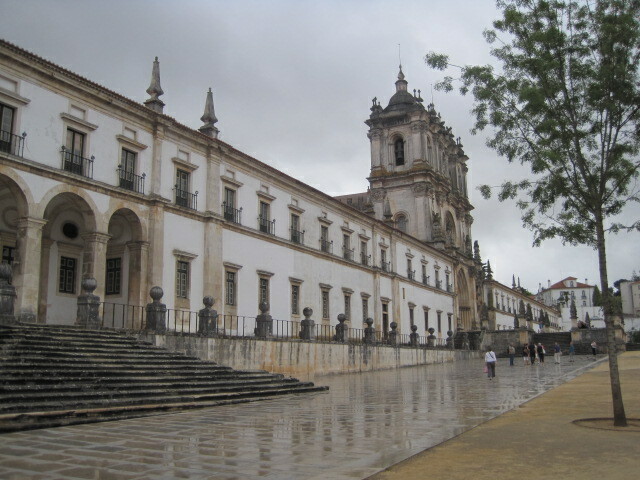 How strange that I visited the monastery there, one rainy day a few years ago. 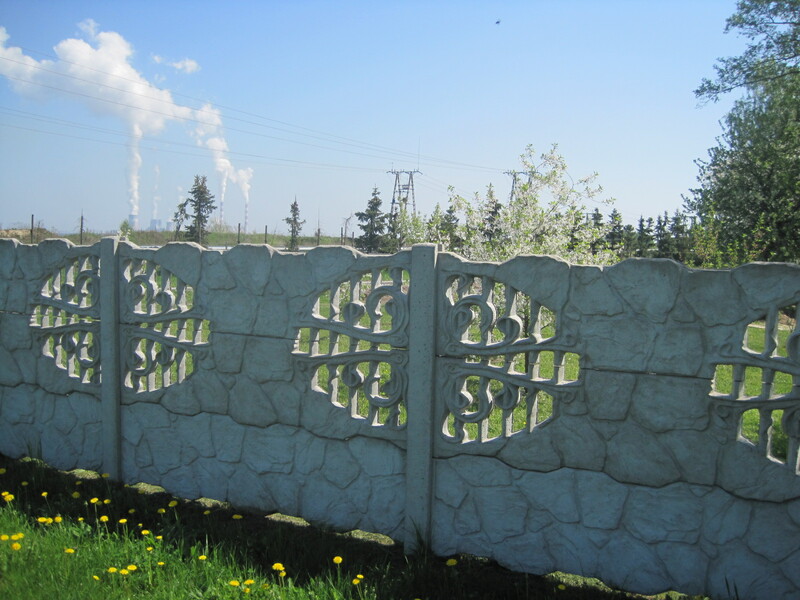 You would have to dig quite deeply on Google to find out much more about Bełchatów, but for me it is a very special place. It’s home to a large portion of my Polish family. Funny how common threads run through life. Many of my relatives work at the power plant, and in Hartlepool, my home on the northeast coast of England, we have a large and ugly nuclear power station. Chief employer in our part of the world, my husband worked there for a number of years. Time to introduce some of my family. Uncle Jakub lives with his wife Czesława (Czescia) in Groholice. 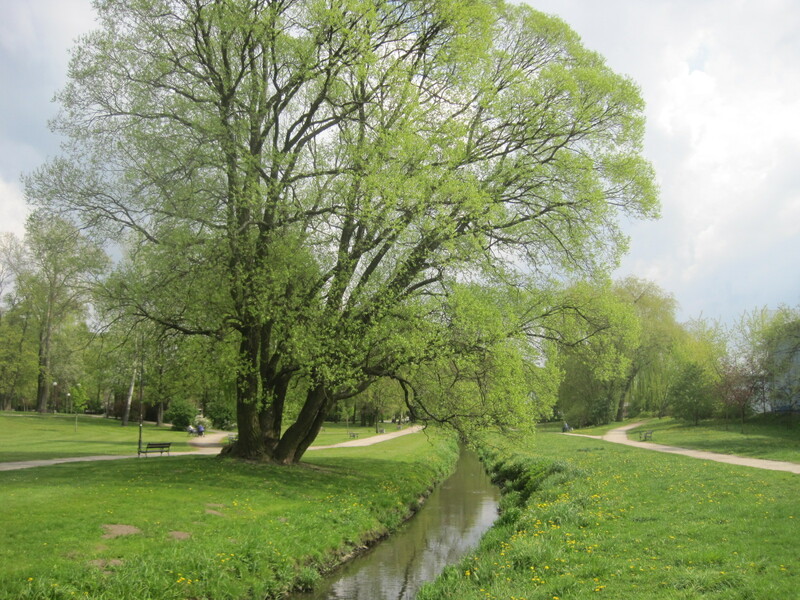 The oldest suburb of Bełchatów, and once a village dating back to the eleventh century, Groholice has lots of charm. 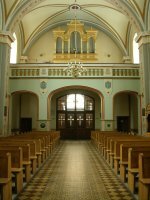 It also has a large and beautiful church, where Jakub’s son Krzysztof married Ilona. They now have a lively little boy, Piotrek. 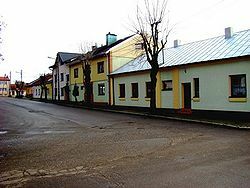 Directly across Ulica Ogrodowa (Garden Street) from Jakub lives daughter Bożena, with her husband Krzysztof and sons Dawid and Kuba. At our first meeting I admired Bożena’s distinctive necklace. When we parted a few hours later she thrust it into my hand as a keepsake. We didn’t have enough words between us for a conversation, but that gesture spoke volumes. 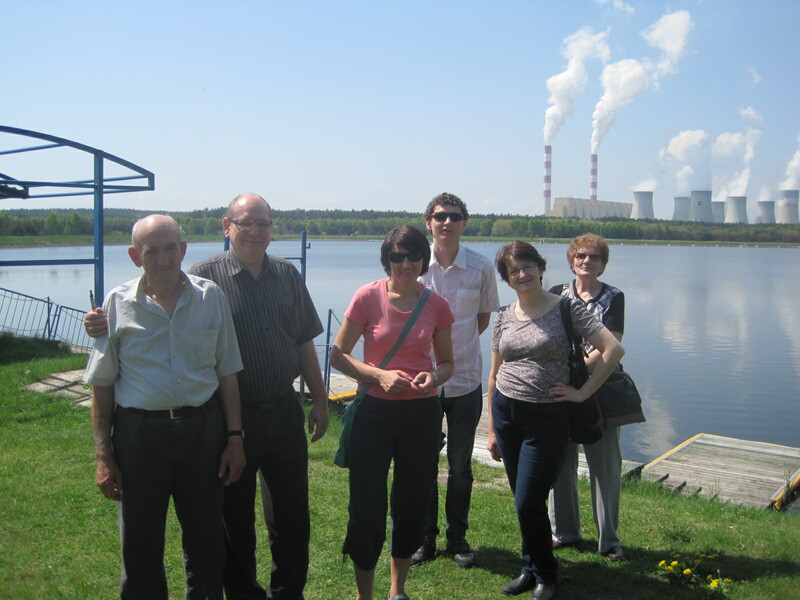 Husband Krzysia (familiar form of Krzysztof) works at the power plant. 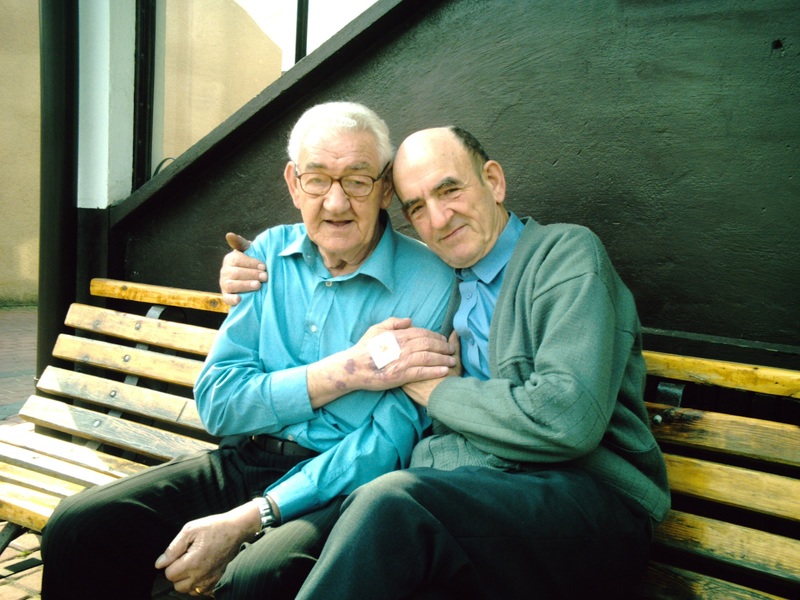 Dad is 15 years older than Jakub and until March 2007 they had never met. Now they are happy to sit for endless hours, smoking and playing dominoes. Sometimes when visiting I take myself off for a wander round Groholice, admiring the characterful houses. 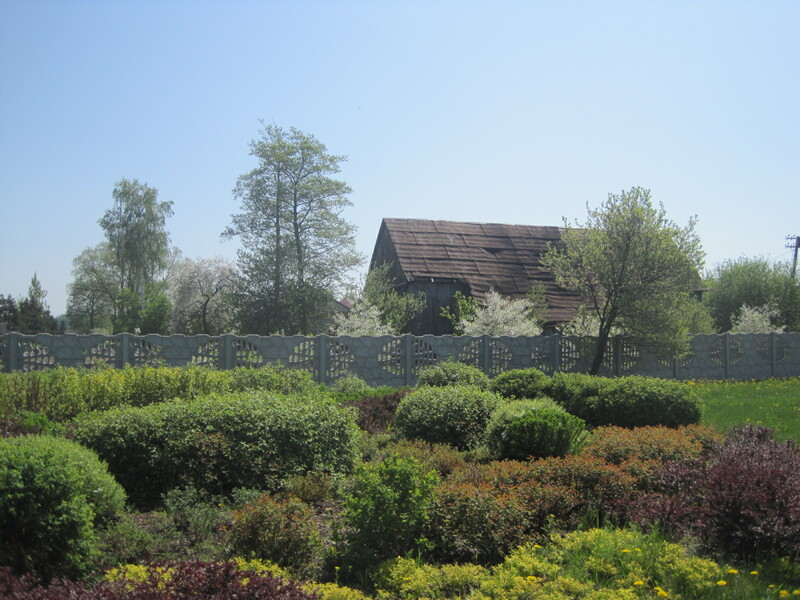 My usual route takes me down to the cemetery, full of flowers and beautifully maintained, as are all Polish cemeteries. It is surrounded by woodlands and open fields so I can browse the headstones looking for more family, or simply enjoy the serenity. Jakub’s oldest son Andrzej lives just a short walk away with wife Renata and son Michał. Andrzej worked the clock round for 8 years, building his own home between shifts at work. Now they have a lovely home, sheltered by woods, with plenty of open space where Michał can indulge his passion for running. Now a tall young man with immaculate English, when we first met Michał was a shy child, cajoled by his father into translating for us. I don’t know who was more embarrassed, him or me! 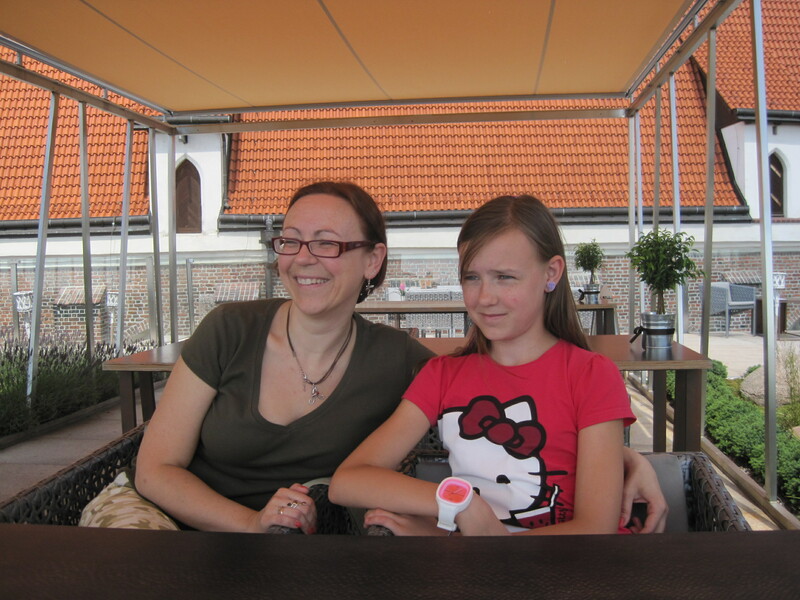 Polish children, in my experience, are much loved but expected to behave well, and they usually comply. 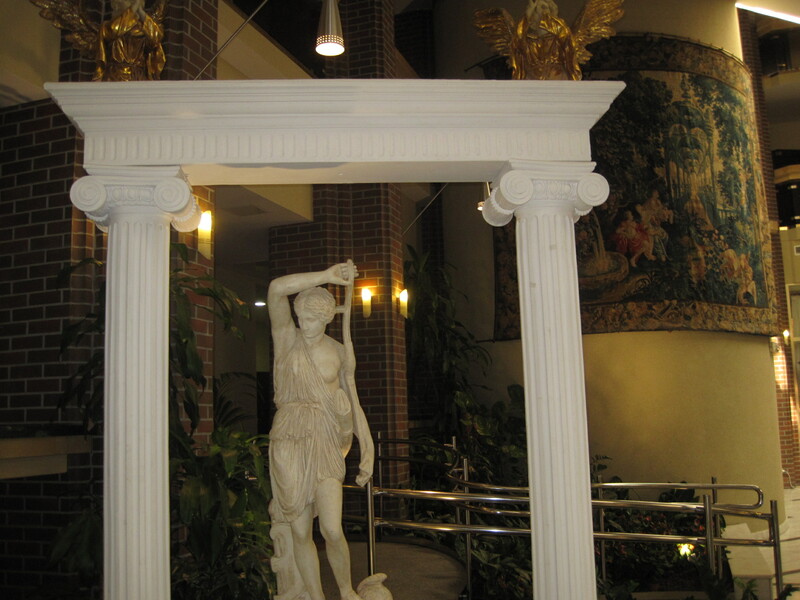 When in Poland I usually stay with family, but on one occasion I stayed in a hotel, with my husband Michael. 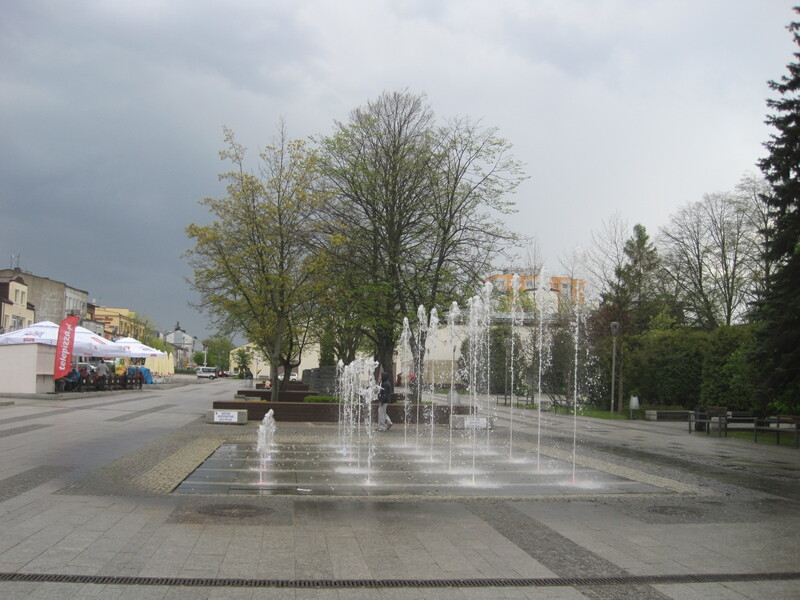 It gave us an opportunity to look around the centre of Bełchatów on foot. Not known for my sense of direction, still I was confident I could find the huge outdoor market. We were attending a wedding in the afternoon and I wanted some flowers to take to the church, and a present for my cousin Jadwiga’s first grandchild, Kinga. Michael wanted some Polish slippers as he’d taken a fancy to the style! At each home a supply of guest slippers lives in the hall- the floors are often polished wood or tiles. It was a glorious hot August day and we had been informed that a nearby park was having it’s official opening so we strolled in that direction first. 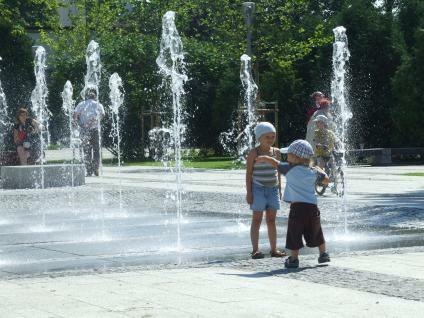 It had the kind of fountains that squirt high in the air unexpectedly, to the great delight of the local children. I could happily have stood under a jet of water myself but instead we bought a drink and hitched up on a wall to watch the rehearsals for the evening performance. A Michael Buble song was being performed rather well and the chorus were strolling through their steps, conserving energy. Time to seek out the market. As usual my sense of direction let me down and in halting Polish I enquired of several locals the whereabouts of the market. Much arm waving let us know that we were in completely the wrong place and we were hot and thirsty by the time we arrived. I was quick to purchase flowers and a lovely little frock for Kinga, but we were a long time finding Michael’s size in slippers. Amazing how many shoe stalls! Back to the hotel for my next challenge, while Michael sat quietly with a book. I had bravely booked an appointment with the fryzjerka (hairdresser) as I knew that the Polish ladies would be very soignee. I didn’t want to let the side down, and how lucky I was! With little conversation other than that I needed to look good for na slub (the wedding) I was transformed into a swan before my very eyes. I could have taken her home with me! This seems like a good place to stop. 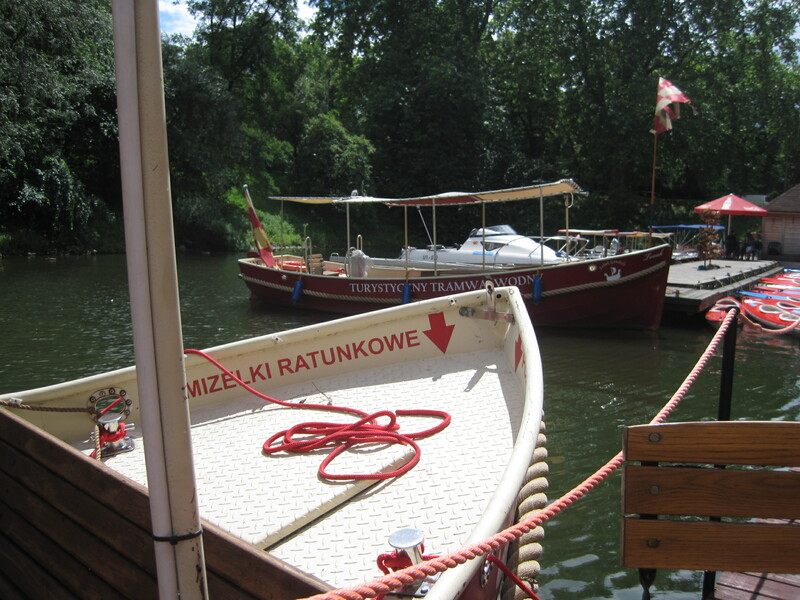 I returned to Poland for a very special wedding in May 2014, and have been back several times since. Many of the photos here are from outside sources, but I have since acquired lots of my own. I linked to Julie Dawn Fox’s Personal A-Z Challenge, and to my good friend Frizz. He was playing Mr. Bojangles– one of my all-time favourite tunes.